This fall, Lee introduced the latest in denim innovation with two new line launches: Curvy Fit and Easy Fit! In usual Lee fashion, each line encompasses extreme comfort while remaining fashion forward and perfectly sleek. 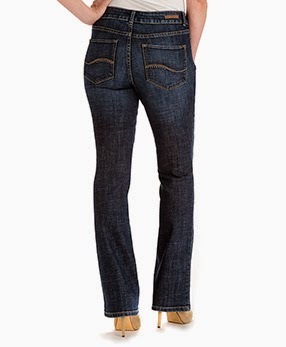 The Curvy Fit line also has straight leg and trouser styles, but my personal favorite are the bootcut styles:) Curvy Fit Jeans allow you to highlight your curves and move with confidence. They are slimming and feature a lower rise in the front and a higher rise in the back. These are great for accentuating curves and they feel really great on! Lee says: "Move over, yoga pants!" Easy Fit pants feature a revolutionary stretch waistband that moves with you all day. The fabric looks like denim and feels like leggings. These would be great paired with a tunic this fall! Both collection feature plus and petite sizes as well, so no matter what size you are, Lee has got you covered! ABCD Diaries gives Lee Jeans an A+! Shop for the whole family this Fall at Lee!